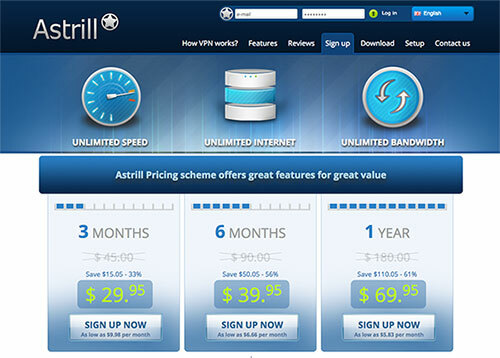 This is our review of Astrill VPN based on our real tests from China. In addition to our Astrill VPN review, we have also reviewed a number of other VPN services. If you are looking for a reliable VPN services to be used in China, Please also read our list of Best VPNs for China. 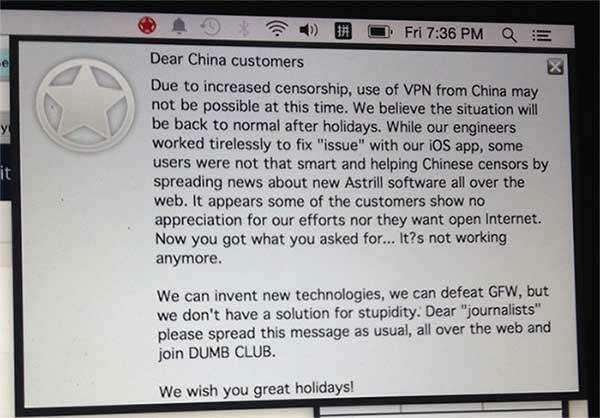 A big target for China’s VPN blocking. Recently often get blocked. Have to pay extra fee to get some of the advanced features. Founded in 2009, Astrill VPN is a well-known VPN provider with a large number of worldwide server locations and it supports all common VPN protocols. In the recent years, Astrill became quite popular in China. Probably because of its popularity in China, apparently Astrill VPN has become a target for VPN blocking. As a result, The main domain astrill.com is not accessible from China at this moment. Its alternative domain getastrill.com is also blocked in China. If you want to sign up from China, you might have to first use another VPN service to visit Astrill VPN’s website, or you can sign up from a country where it’s not blocked. However, once you’ve signed up and downloaded its VPN client, you can use Astrill VPN from China. Many Astrill users in China became upset about this message. Astrill has servers in a large number of countries it offers three major connection types: OpenWeb, OpenVPN and StealthVPN. OpenWeb is for web browsing only (traffic from desktop applications won’t go through VPN). OpenVPN is for both browsers and desktop applications. StealthVPN is Astrill’s customized version of OpenVPN, designed specifically for China users to avoid blocking (StealthVPN requires additional cost of $2/mo unless you pay for 1 year). In addition to VPN services, Astrill also sells routers with VPN built in. Astrill offers a couple of handy features to improve user experiences. Its Video Accelerator is designed to speed up video streaming. Its Application Filter allows users to specify which applications will go through VPN and which not. Astrill also provides a Site Filter function, which can be used to specify which site(s) you want to (or do not want to) tunnel through VPN. This feature is potentially helpful to speed up connection speed for loading local websites. For simultaneous connections, Astrill VPN’s basic account allows only 1 computer and 1 handheld device to be connected at the same time. However, If you purchase the ProAddon ($5/mo), you can connect 2 devices of any type simultaneously. If you purchase the Home Plan Addon ($5/mo), you will be able to have 5 simultaneous connections. In addition to common VPN protocols, Astrill offers a customized version of OpenVPN, called StealthVPN, that is designed specifically for China users to avoid blocking. Unlike most VPN providers we have tested, Astrill VPN has a few servers located in Mainland China. For this reason, Astrill VPN can also be used to get a China IP address from outside of China (VPN into China). Astrill offers 3 plans: $29.95 for 3 months (equivalent to $9.98/mo); $39.95 for 6 months (equivalent to $6.66/mo) and $69.95 for 1 year (equivalent to $5.83/mo). 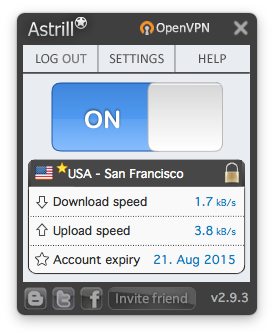 Regular VPN users can use Astrill VPN on only one device at the same time. When you sign up for Astrill, you will find they try to sell you additional add-on services that cost more. For example, their Home Plan allows you to use up to 5 devices at the same time at an additional cost of $5/mo; Their StealthVPN service (for avoiding blocking in China) costs $2/mo or free with 1-year plan; Their VIP add-on ($10/mo) provides servers connected directly to China providers for better speed and lower latency. Astrill offers a 7-day free trial for users to try out their VPN service. Astrill provides software for many platforms, including Windows, Mac, Linux, IOS, Android etc. We downloaded their desktop client for Mac OS. The installation process was straight-forward and the software interface is clean. With the desktop software, you can connect/disconnect to VPN and also change servers and switch connection methods. However, we found their settings menu is a little messy with many options showing together that it might confuse regular users. Sometimes it’s hard to find where to go for certain options. When the Astrill VPN client software is running, an icon will stay on the menu bar (or called system tray on Windows), and it will indicate whether you are currently connected or not. Then we used Astrill’s Mac desktop client to connect to their USA server (China Optimized 3) using the StealthVPN protocol. we got a download speed of 12.87Mb/s, which is a decent speed. However, we encountered a number of connection failures with or without using Astrill’s StealthVPN protocol. A number of servers are not responsive and cannot be connected to. 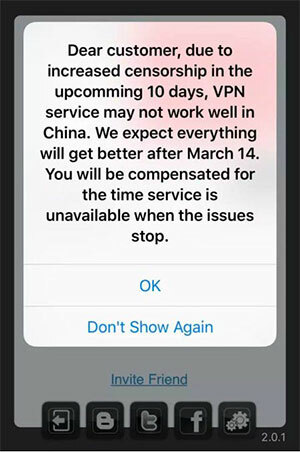 When using StealthVPN, which is designed specifically for preventing blocking in China, we saw less connection problems. But keep in mind that you must pay another $2/mo to get StealthVPN unless you subscribe their 1-year plan, which includes StealthVPN for free. On Astrill’s website, there’s a link for chatting with customer support live. When we started the chatting window, we were told to wait in line and the waiting time was around 10 minutes. After the 10 minutes had passed, we were shown a message suggesting us to leave a message instead. As a result, we weren’t able to chat directly with Astrill VPN’s customer service representative at all. This entry was posted in VPN Reviews and tagged astrill, review. Bookmark the permalink.